I'm starting my 2014-15 walking season with a new camera. The Olympus PEN E-PL2 micro four thirds camera system served me well in 2013 but I have replaced it with an upgraded version. I now use the E-PL5 version, which I got mainly for the improved sensor. It takes the same interchangeable lenses that the other Olympus Four Thirds cameras (such as my old E-PL2) use and I have also obtained an improved VR-4 add-on viewfinder (in addition to a flash attachment, adaptors to fit non-Olympus lenses such as my old Nikon manual focus lenses and 420mm F6 telescope, and other equipment. In the future I plan to add a web pages with information about this camera system, similar to the page with links related to the E-PL2 camera (I will continue to use the excellent E-PL2 as my second camera). I will continue to be tempted by the more advanced versions of the Olympus Four Thirds cameras, such as the EM1 professional model. 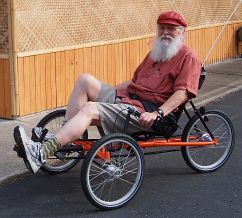 As mentioned on the 2012 page, I now have a Terra Trike Rambler (pictured at the left), which I frequently use for exercise to control my blood sugar readings. However, my use of the trike for photo purposes has been limited. I sometimes carry my photo equipment in a saddlebag and make occasional stops to take photos, but I haven't yet worked out a good routine for taking "photo rides". The annual Mason Down Home Days Festival was held on this Saturday. I came home with a nice collection of cookies and brownies and some very nice hot pads for the kitchen. There is always a number of interesting booths selling homemade products as well as food and other interesting products. I enjoyed the entertainment stage (clog dancing) and all the friendly people. It seems only recently this annual music festival was established in Mason, but this year we are having the 5th annual event. I was unable to keep up the pace of the last two years and only was able to document half of the 14 bands that took part. Here are some photos of this fabulous event. The annual Ingham County Fair opened on Monday July 28 and I attended on the opening day as usual (that's when they have their bake sale of entries to the baked goods competition). Independence Day is always special in Mason with lots going on. This page documents the car show, the parade preparations at the Mason High School, the 4th of July parade, the viewing site at Mason High School for the fireworks display and a few fireworks photos. I recently noticed a couple life-sized wooden statues of soldiers on Ash Street in front of the City Hall parking lot, so I decided to take a closer look on my walk tonight. Instead of the two soldiers I was expecting when I left I found eight of them, and three weeks later the same number of wtatues were still there. Most of the photos on this walk page are of the soldier statues with several other photos of the nearby area. Some construction is going on in Mason at this time. A building was being demolished on Ash Street opposite the City Hall statues and the front of the building next to the Daily Scoop ice cream shop on Jefferson Street was being refurbished. Once again I explored my neighborhood with an ultra-wide zoom lens. There is nothing extraordinary here, just views that caught my eye as I took my exercise walk. Mason is a very nice place and a wonderful location for walks. I found my favorite tree. The home-owner stopped his lawn mowing to ask my about my photography, He had noted the large number of ants that spent time on his tree and had assumed I was taking ant photos. However, I just find the bark of this tree remarkable and hadn't noticed the ants. Perhaps next time I'll use a macro lens to capture some shots of the ants. Today's walk was prompted by a spike in my blood glucose number, which for me is an indicator of the need for an exercise walk. My objectives were to document some of the simple things around Mason, using the moderate wide angle lens to its best, plus (after I saw all the flags and recalled it was Memorial Day) show the big display of flags common around Mason on such days. Tonight I was inspired to take a moderately leisurely walk about Mason within a mile of my home. My intention was to photograph scenes using the view of a single lens, the Olympus 9-18 ultra wide zoom. I spent about an hour finding suitable views showing a variety of subjects from buildings to more open views. Sometimes it felt like I was in the country, other times in an inner city area. There is such a variety within short walking distance. Views include the city library, post office, Ingham County Courthouse and some nice urban art. The emphasis was on points of view particularly suited for wide angle shots. Every Spring is welcomed in Mason with the Spring Fling, a celebration of the end of winter and a chance to do some fun shopping. The town square is surrounded by booths with local artisans and other interesting people. I particularly enjoy the bake sales by churchs and community organizations. I was welcomed in one bake sale booth by people who remembered me buying stuff there last year. I always stop by to visit the American Legion people to buy a poppy to remember our veterans. Then I make the rounds pausing to buy various cookies, breads and other tempting goodies, which makes life difficult for a diabetic like me. Oh, well, I can eat anything ... in appropriate quatities. I took a good variety of photos showing the various aspects of the Spring Fling with the color, the food and many nice people. This year marked my fifth straight year participating in the Mason State Bank 5K race, which benefits the Mason Public School Foundation. I was far from prepared this year. The brutal winter kept me inside the house until recently. And I'm a year older than last year. Does this all add up to explan my worst time this year? I felt ill after my 3K practice run several days before the race, but I got a new pair of running shoes, rested for a couple days, avoided food immediately before the race, and went out and gave it my all. At least I was able to finish the race, which felt like an accomplishment. 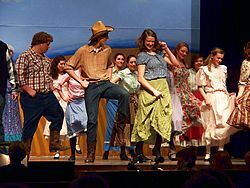 Annual High School Production of the Musical "Oklahoma!" This is my grandson's Senior year of High School at the Mason HS, where they presented the Rodgers and Hammerstein musical "Oklahoma!" May 1 - May 3. Here are some photos I took at the May 1st performance, with a bit of focus on my grandson Tobias Webb (as Will Parker). Go to: 1 May 2014 High School Musical "Oklahoma!" Here are a few photos (fairly randomly shot) from my first photo walk of the season. The pleasant Spring weather was a most welcome change from the rather brutal past Winter. I took my new Olympus PEN E-PL5 camera with 14-150 zoom along and took a nice 46-minute walk west to Cedar Street and back through the neighborhood on the other side of Sycamore street. Hopefully I'll be able to put up a page of links for this camera similar to the one (Olympus E-PL2 links) for my older camera. The larger versions of the photos is downsized to 20% due to the larger size of the high res photos taken with the E-PL2. The E-PL2 photos were downsized to 25% of the originals.